Penn State's Miles Sanders is a Pittsburgh native returning home for Saturday's matchup against the Panthers. Miles Sanders and Lamont Wade are roommates and Pittsburgh guys who played some big games at Heinz Field while in high school. They will return Saturday night for another big game, although this time they'll be wearing Penn State uniforms. They will line up against Pitt players whom they competed against in high school, or whom they knew growing up. They're excited about that but they insist it has nothing to do with the rivalry between the two schools that's been built up over 98 previous meetings. "I know a pretty good amount of people on the team, but it doesn't change," Sanders, the Lions' junior running back, said Tuesday. "It's just another opponent. And it's a friendly game, so not really like a rivalry or nothing. It's a special game just playing against my friends that I know back at home." Wade also knows a number of Pitt players, including a childhood friend and former Clairton High School teammate, wide receiver Aaron Mathews. "That's my brother," he said. "We played high school together, grew up together, played Little League. But that doesn't change nothing at all, same preparation every week, same mentality." Sanders' second varsity game at Penn State came in 2016 at Heinz Field, where he returned a pair of kickoffs. Wade, the Lions' sophomore safety, was a high school senior then and watched the game from a special section — "the front row in the recruit tickets for Pitt," he said. The Panthers won, 42-39, but Wade said the result did not have him leaning either way. The four-star-rated player wound up committing to Penn State three months later. During his recruiting visit to Happy Valley Wade was hosted by Sanders, of Woodland Hills High, who was ranked the No. 1 high school back in the country when he signed with Penn State. "I knew him since high school," Sanders said. "We're not from the same area, but we played teams from his area. I know him pretty well. He's my roommate now, and he's got that dog mentality since he's been here. That's just the way we grew up over there." "I've been cool with Miles since high school," Wade said. "Just to see how patient he's been for these two years controlling what he could control, and now it's finally his time, is amazing to see." 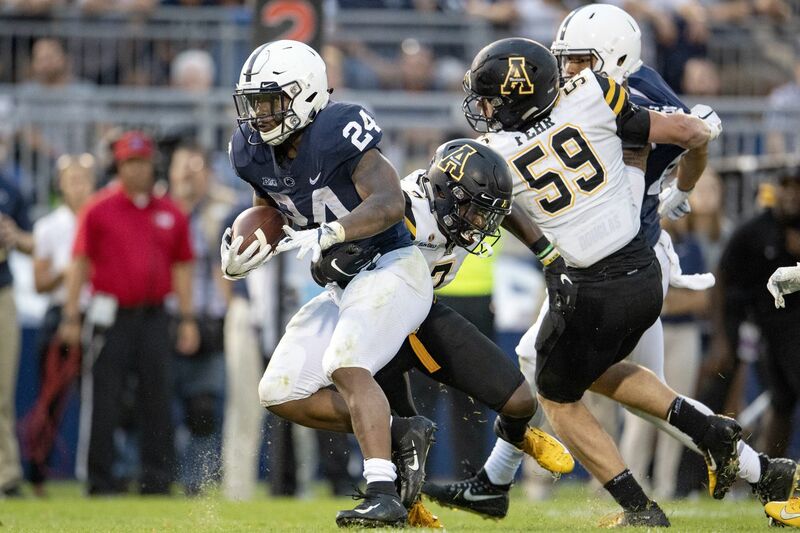 The successor to Saquon Barkley, Sanders had a good opener last week for the Nittany Lions, rushing 19 times for 91 yards and two touchdowns, including the eventual game-winner in the 45-38 overtime victory over Appalachian State. Wade, who switched from cornerback to safety in the spring, was part of the safety rotation and laid a big hit on Mountaineers quarterback Zac Thomas. This is an eagerly anticipated game for both players, two of six on the Penn State roster from the metropolitan Pittsburgh area. Sanders' team lost the 2015 WPIAL championship game at Heinz Field, and Wade played for a title there more than once. "It's just going to be real good to get back out there and play this game," Wade said. A loud, passionate crowd will fill the stadium for Saturday night's kickoff, but Sanders said the Nittany Lions will not allow the hype to take away from their focus. "The fans like to hype it up as a rivalry and stuff with Penn State students and Pitt students," Sanders said. "They have that, I guess, little rivalry. But it's just another game for us. It's just like the Super Bowl every week and we're just ready to be 1-and-0 this week, that's all."